My greatest concerns about Bluebirding - Harry Schmeider "The Ambassador for the Bluebirds"
Male House Sparrow seen here with that distinctive black bib under its neck. These birds are killers of all nest cavity birds. They are an invasive species to America and not a protected species, therefore you may dispose of it at will. Please read my blog (Lets Talk Bluebirds) concerning house sparrows on this website. House Sparrow attack on a bluebird. The first thing the house sparrow will do is to follow the bluebird into the nest box and blind him by pecking his eyes out and then beat on his head until the bluebird is dead. The house sparrow is not finished yet, he opens the back of the bluebird and builds his nest on top of the carcass and raise his family. He will also kill nestlings or carry them out of the nest box and drop the nestling over water or on roads. ​Many people put up nest boxes with the best intentions of doing the right thing, but for various reasons, after a time the nest box go unchecked and forgotten. It is tempting to think, “I put up a box; the birds can take care of themselves; - I’ll leave it up to nature.” Other folks with good intentions will put up a nest box in a habitat that is inappropriate for the species they are trying to attract, and/or is susceptible to hostile takeover by house sparrows (non-native predators) and simply give up, allowing the house sparrow to win. 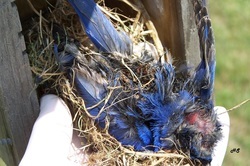 Unfortunately, allowing these scenarios to play out does far more harm to ALL native cavity nesting birds, not just the bluebirds. It is best to take down the unmonitored nest box. 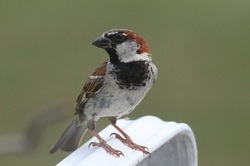 I encourage you to learn more about house sparrows and other predators before you put up ANY nest box. Putting up a nest box is a commitment to monitoring it. Monitoring it, as you will experience, can be great fun for the entire family, is educational, sometimes surprising and incredibly rewarding. Please read my Blog "Lets Talk Bluebirds" and become an educated Landlord to theses wonderful birds. Should you have any questions after reading my blogs feel free to contact me at harryschmeider@gmail.com or 724 285 1209.